When Should I Call the Doctor About Dandruff? What Are the Exams and Tests to Diagnose Dandruff? What Are the Dandruff Home Remedies? What is the Medical Treatment for Dandruff? What Are the Medications for Dandruff? What Are the Next Steps in Treating Dandruff? What Is the Follow-up for Treating Dandruff? How Do You Prevent Dandruff? Dandruff is a very common skin condition that nearly all people experience at some point in their lives regardless of age or ethnicity. It affects the not just the scalp, but also the ears, eyebrows, sides of the nose, beard, and less commonly the central (often hair-bearing) part of the chest. Dandruff can affect any hair-bearing area or an area with even very small hair follicles. Other names for dandruff are seborrheic dermatitis and seborrhea. Dandruff is seen in all ages from babies to the elderly. In infancy, scalp dandruff is commonly known as "cradle cap." In the teen years, it has been called "druff" for short. Some people are simply more prone to dandruff, and others experience periodic clearing cycles and periodic flare-ups of the condition. Dandruff typically looks like dry, fine flaky skin on the scalp, sometimes with areas of pink or red inflamed skin. Many individuals have no scalp symptoms but simply complain of white flakes on their shoulders, particularly noticeable on dark clothing. More advanced cases may cause intense itching, burning, and unstoppable scratching. Some people are more prone to dandruff, and dandruff tends to be a chronic or recurrent disorder with periodic ups and downs. Although it is not curable, it is generally quite easily controlled with proper skin and hair hygiene. In babies, cradle cap usually clears after a few months. It may recur later in life as typical dandruff. For some, dandruff may worsen with time. Although it may occur for a short period, dandruff tends to recur throughout a person' s life. Severe dandruff may be a very difficult and frustrating condition. An ongoing combination treatment of shampoos, washes, and creams and lotions may be required to treat resistant cases. Overall, dandruff treatments are very safe and effective. The best shampoo choices include those containing zinc pyrithione, selenium sulfide, and tar-based shampoos. Prescription dandruff shampoos such as ketoconazole offer no benefit over over-the-counter brands. The exact cause of dandruff is unknown. Possible causes and associations include increased oil production and secretion, and increased numbers of normal skin yeasts. Bacteria have not been found to cause dandruff. Dandruff is not a fungal infection and is not the same as scalp "ringworm," which is actually a fungal infection called tinea capitis. Dandruff is not contagious. Dandruff may also be triggered or made worse by poor hygiene and infrequent shampooing and washing. The immune system may also play a role in dandruff. Although mild dandruff is a very common condition in many people with a normal immune system, severe dandruff is more common in people with some chronic illnesses such as Parkinson' s disease or a compromised immune system as in advanced HIV/AIDS. Dandruff probably has a small hereditary component making it more common to run in families. One of the most common and often the first symptom of dandruff can be white flakes seen on dark clothes. Scalp itching may be another common first symptom. In some, the initial noticeable symptom is simply dry facial skin without any other rashes. Patients may see their physician complaining of dry skin that fails to respond to daily lotions and creams. Often they have used every lotion possible from the drugstore or more expensive department stores. Frequently this is caused by undiagnosed scalp dandruff that is causing problems "downstream" on the face. Dandruff can be located in areas of the body with hair follicles. It is most typically found on the scalp, ears, face, and middle of the chest. Seborrhea is not seen on the palms and soles where there are no hair follicles. If dandruff is worsening (spreading, causing hair loss, increasing redness, painful, or infected) despite proper skin care and hair hygiene, call a dermatologist for an office appointment. Dandruff is not a medical emergency and should not be handled in a hospital emergency department; call a pediatrician, family physician, internist, or dermatologist for a consultation. If an individual is so uncomfortable with his/her dandruff that his/her social, sleep, work, or other daily activities are disrupted, he/she needs a more effective treatment and should see a health care practitioner. In rare instances, highly atypical cases may require more exams and tests including skin scrapings for, microscopic evaluation, and skin biopsies. A health care practitioner may scrape some scales off the rash and look at them under the microscope to make sure the rash is not caused by a fungus. A very small piece of skin may be taken (a biopsy) for microscopic examination to exclude other causes like psoriasis, lupus, and other skin diseases. All affected areas including the scalp, ears, face, and chest should also be washed with the therapeutic shampoo. People who shampoo less often (once or twice a week) are usually much more prone to dandruff. Simply increasing shampooing frequency often helps clear mild dandruff. Getting rid of dandruff permanently is not possible. Skin inflammation may be treated with topical applications of mild over-the-counter hydrocortisone 1% over two to four weeks. Apply the steroid cream sparingly one to two times a day to the affected skin areas to help decrease inflammation. For face and ear dandruff, washing the areas with a dandruff shampoo may be very helpful. Avoid oily or heavily oiled hair and skin products. Avoid closely fitted hats, caps, head wraps, or helmets. Eyelid dandruff may be treated with gentle daily applications of baby shampoo. A cotton tip applicator may be used to clean the lash margin while avoiding getting the shampoo directly into the eyes. "Cradle cap" in babies may be treated with more frequent scalp washing using baby shampoo. For really thick, stuck-on scalp flakes, a small soft toothbrush dipped in warm olive oil can be used to very gently massage away some of the flakes daily or every other day. Care should be taken not to scrub or aggressively rub the fragile scalp skin. Since dandruff tends to be chronic, the person should not expect an overnight cure or quick response. Dandruff control may require long-term skin and hair care for best results. Once a healthcare practitioner has confirmed an individual has dandruff (seborrheic dermatitis), the main treatment includes antidandruff shampoos, cleansers, and anti-inflammatory creams and lotions. More importantly, often the most effective dermatologic treatments are combination treatments using several different medicated ingredients used at the same time. Over-the-counter shampoos and steroid cream medications are the usual treatments. More frequent shampooing and cleansing is usually recommended. For severe cases not responding to a combination of steroid creams, foams, sprays, or lotions, alternate treatments may be tried. A dermatologist may be very helpful for resistant cases that have not cleared with standard therapy. Rare severe cases may require short-term treatment with oral steroids such as prednisone. Oral pills are not the mainstay of dandruff treatment and should not be routinely used. Antifungal shampoos – Prescription-strength shampoos help decrease the yeast counts on the skin, but work no better than over-the-counter dandruff shampoos. Antibacterial cleaners – Prescription-strength washes such as sulfacetamide help decrease the bacterial counts on the skin, but are of little benefit in the treatment of dandruff. Cortisone shampoos – Prescription-strength steroid shampoos in rinse-off products help decrease the inflammation and decrease itching. Corticosteroids – Prescription-strength cortisone preparations as "rub in and leave on" products help decrease the inflammation and control itching. These vary in strength, the strongest of which is about 1,000 times the strength of over-the-counter hydrocortisone! Topical cortisones are safe when used appropriately under a physician's care and guidance. As there are some, possible long-term side effects of all steroids, they should be used sparingly and only where needed. Many cortisone preparations are available including ointments (more greasy, clear, petroleum-based) creams (thick, white, and lubricating), lotions (light, flowing liquid), solutions (clear watery liquid, often alcohol-based), sprays (clear liquid in propellant), and foams (light, airy mousse). The patient may consult a health care practitioner if the dandruff does not respond to over-the-counter therapies. In rare instances, severe dandruff may be a sign of underlying disease such as HIV/AIDS or other immune system disorders. In such cases, further lab testing or medical workup may be required. Use all shampoos and medications as prescribed and expect gradual improvement. Keep in mind that many people have dandruff, and most individuals do require long-term changes in skin care and a commitment to proper hair and skin hygiene. If prescription medications are not controlling the dandruff or prescription medications are running out, make an appointment with a healthcare practitioner. See a health care practitioner once or twice a year for this condition. If the condition spreads or changes substantially, make an appointment with a health care practitioner to make sure there are no new conditions or diagnoses. The outlook for dandruff is good. Although dandruff is not curable, it is controllable. While the exact cause remains unknown, typically dandruff is easy to control with medicated shampoos and topical cortisone products. 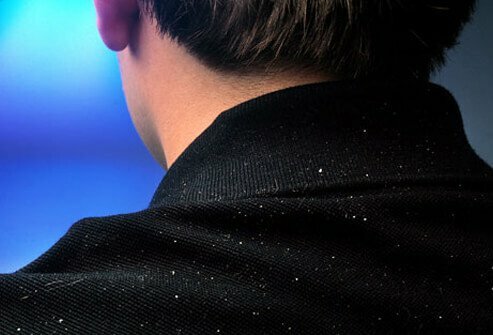 Dandruff may spontaneously clear even without treatment. Babies frequently completely outgrow their dandruff or "cradle cap." Since most common dandruff tends to be chronic, this means an individual may have occasional flares and remissions of the symptoms, more at times of poor health or stress. Dandruff is certainly unsightly and it can be a cause for concern. Is it just a result of poor hygiene? Or is there a medical reason for dandruff, so that the sufferer "can't help" but have it? The answer isn't so simple. While doctors don't know exactly what causes dandruff, we do know it is a very common condition that affects nearly everyone at some point in their lives. It's not the result of a bacterialor fungalinfection (like the misnomer "ringworm" of the scalp). Some potential causes for dandruff have been suggested, including increased oil production of the skin, increases in certain skin secretions, and increased numbers of normal skin yeasts, but the exact cause of dandruff has never been established. "Seborrheic dermatitis in adolescents and adults"
Please describe your experience with dandruff. What was the treatment for your dandruff?